Businesses across many different industries can save both time and money by using extruded aluminum parts in their designs. An extrusion is a piece of metal that has been shaped by being pushed through a steel die. The manufacturer can use a standard extrusion die, which creates commonly used shapes, such as T-shapes, H-shapes, C-shapes, tubes, rods, and bars. It is also possible to create custom shapes using a custom extrusion die or profile. Custom aluminum extrusions can be created in just about any shape you could ever imagine. The metal gets squeeze through the die and comes out in a long length that features a constant cross-section. The cross-sections then get cut into pieces according to the customer’s specifications. When it comes to custom sustainable aluminum extrusions, just about any shape or size part, product or component can be created. When you create a custom extrusion die you can reduce or even eliminate the need to fabricate and weld separate pieces. Not only will this save you time on the overall project or build, but it will also reduce cost. Custom aluminum extrusions provide consistent results, which can help when the project requires you to replicate a single piece or component multiple times. Working with a company like Silver City Aluminum gives you an even more significant advantage. Our team of highly trained and experienced engineers and designers can help you create a piece that will produce the results that you desire. The more that we can do to improve your satisfaction in our sustainable aluminum extrusions, the more satisfied we are in the work that we produce. If you are not familiar with how extrusion and fabrication works, it is actually pretty straight-forward. All it requires is a billet of aluminum alloy. We use a variety of alloys, depending on the demands of each project. The metal is heated up to a specific temperature, which softens it and makes it easier to extrude. The aluminum billet is then pushed through either a standard extrusion die or a custom extrusion die at over 10,000,000 pounds of pressure. The metal flows through the die or profile, and it comes out in the exact shape that the client has ordered. Sustainable aluminum extrusions are then cooled, stretched, and cut according to the client’s specifications. Some may require long parts, while others may need very short and small pieces. Aluminum is ideal for this process because of its inherent qualities. While you may think of aluminum as fragile and weak, as we see this metal most frequently in beverage cans and containers, it is actually very strong. Light in weight, yet high in strength, aluminum is the perfect material for many different industries. There are benefits to using both standard or stock extrusions, and a custom extrusion die. The advantages of custom are apparent, you get to design the profile to create any shape that you want. It is possible even to include designs that will help to enhance the natural anti-corrosive nature of the aluminum material. Stock or standard extrusion die pieces also have advantages. Parts like bars, tubes, T-shapes, H-shapes, and C-shapes are used in the construction of everything from buildings to lawn furniture. Everyone knows the shapes, and they are easy to use in conjunction with other manufacturing efforts. 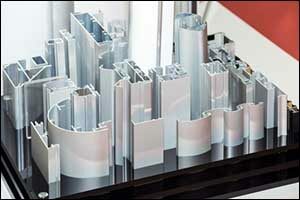 Companies like Silver City Aluminum will often have a large selection of standard extrusion die and profile options. Make sure to ask what is available when you place an order for sustainable aluminum extrusions. You can integrate these pieces in with other parts to further reduce your overhead costs. However, it should be noted that creating a custom extrusion die is not prohibitive to any budget. In fact, custom shapes can eliminate welding, joining, and other methods of generating custom shapes post-extrusion. Our engineers can do some pretty amazing things, and we are excited to share them with our clients. If you are in need of sustainable aluminum extrusions for your project, build, or business, give us a call at 608-824-8631. You can also use our online contact form to reach an engineer or technician. Our website features detailed information about everything from design to extrusion, fabrication to finishing, and individual sections for customization, alloys, and shipping.